The Captain stated it back in 2015, and it still stands true three years later–“February is the month for boat shows in central and western Montana”! With the big boat show and sale going on starting February 9th, with Trevor Johnson giving a FREE fishing seminar at Bretz RV & Marine, you won’t want to miss the discounts and deals while prepping for summer by shopping for a boat while you dream of warmer weather with free hot chocolate and coffee. Although, the weather is pretty mild now, so it’s not really too bad out there. It feels more like spring than winter. Experienced and successful tournament anglers like Kris Keller from Wolf Point Montana rely on his Hummingbird sonar electronics to locate fish. “I trust what I see on my Hummingbird, when it tells me there is fish under my boat then it is my job to find out what will make them bite”, he said. Keller who has won numerous walleye contest on Fort Peck Reservoir isn’t the only angler that depends on his electronics. Jim Muzynoski from Bozeman who is a guide on Fort Peck and Canyon Ferry says electronics give him an edge when fishing, “I look for fish but also electronics will give you an idea on what kind of structure is under the water”. The Captain goes on to talk about the best trolling motors and names the most popular brand of trolling motor used by tournament anglers and how this trolling motor almost gives an “unfair advantage over the fish they are trying to catch”. 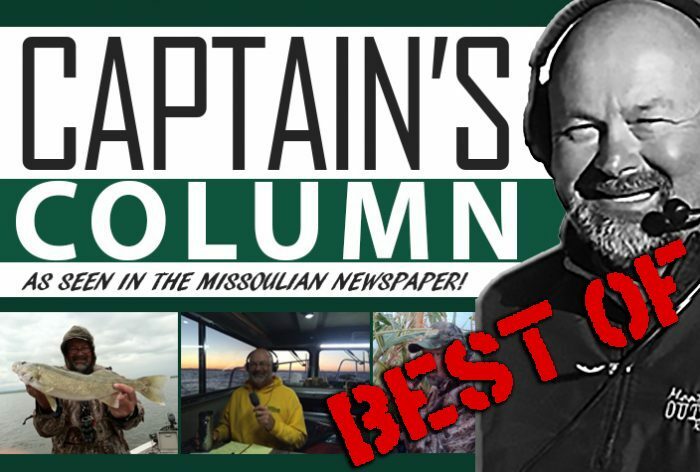 Read the Captain’s full Captain’s Column from this time back in 2015 here to check out this week’s BEST OF Captain’s Columns! !